Oh yes, it’s that time of year! My favorite all time season is now here and so is pumpkin everything! I just love pumpkin, everything pumpkin, how can you not love this happy round orange squash? Paired with spices, it has a warming effect on the body and soul. 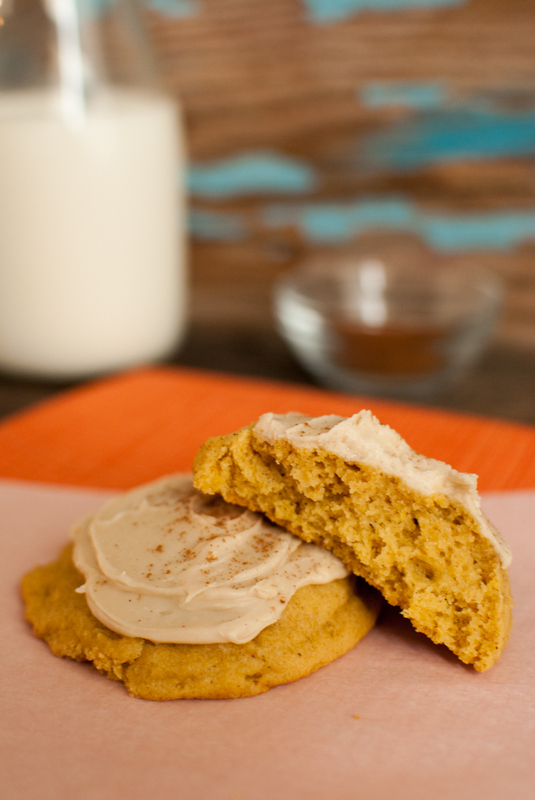 On chilly foggy Fall mornings, a pumpkin scone and coffee warms you up quickly and puts a smile on your face. I have yet to see a grumpy grouchy person drinking a pumpkin spice latte- does not exist I say! These cookies came about when I had an epic fail with the newly pumpkin spice M&M’s…. yes, you read that right! I was soooo excited that M&M’s came out with a pumpkin spice flavor. Last year it was pumpkin kisses, so of course I was deciding what to do with these for about a week. Target is the only place to find them, and they can’t keep them on the shelf at the moment! Ok, my quick review of these little candies…where is the pumpkin flavor??? I can smell the spices in the bag, but the candy tastes a lot like chocolate. So I wanted to add more pumpkin flavor and thought, hey a pumpkin spice cookie with pumpkin spice M&M’s right? Well…that was a big FAIL! The candies melted way to much and the taste just didn’t seem right. I guess some cookies are not meant to be. 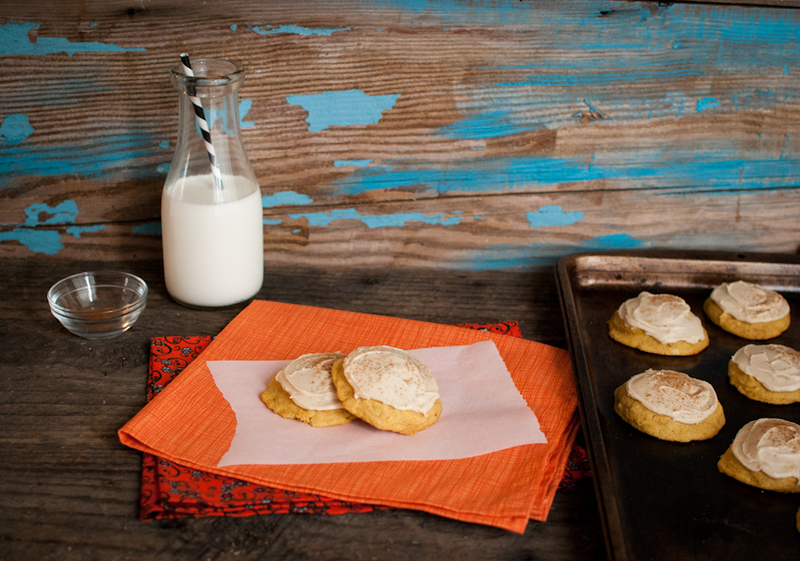 So back to my pumpkin spice cookies….soft and buttery, these remind me of my grandma’s ginger creams. She always made those around Christmas….I will be posting that recipe in the near future. The icing on these have brown sugar and butter giving these soft cookies a nice sweet finish. The cookies are great on their own, but the frosting just completes it. 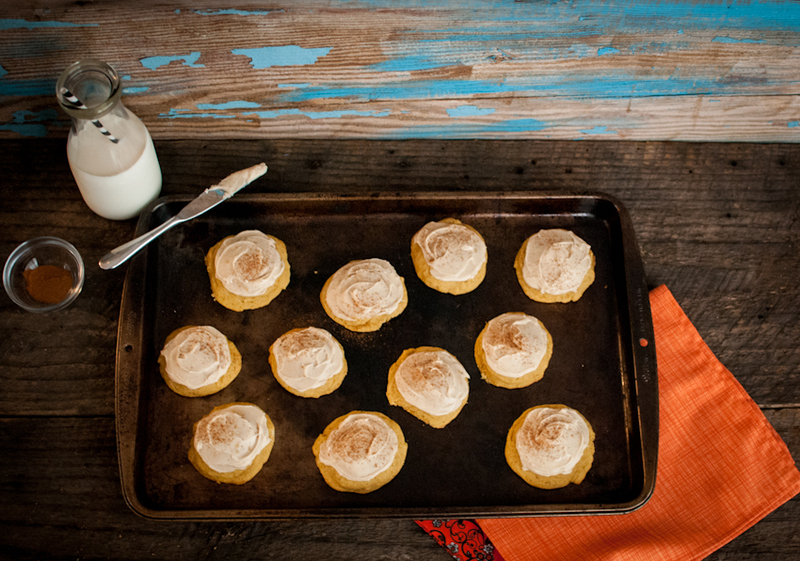 With a sprinkle of cinnamon, it’s all kinds of Fall season in a cookie! A bit of a warning though, they won’t last a day in your house, very addictive they are! And the pumpkin spice M&M’s…not missed at all…I think the pumpkin spice flavor is more hype than a hit. In a large mixing bowl, beat the butter on medium until smooth. Add the sugar, baking powder, baking soda, salt, cinnamon and nutmeg and mix until smooth and combined. Now mix in the egg and vanilla for about 30 more seconds. Add in the pumpkin puree, mixing on medium for about 2 minutes. Batter will look a little lumpy but mostly smooth. Add the flour, starting mixer on low. Mix just until combined. Drop by teaspoons or use a cookie scoop, onto parchment lined cookie sheets. Bake for 12 minutes, until cookie is soft but firm. In a small saucepan, melt the butter and brown sugar until smooth. Remove from the heat. Pour into a medium bowl and add the remaining ingredients except for the cinnamon. Mix on medium until desired consistency. You may need to add more milk for a thinner frosting. Frost cookies and dust with cinnamon. These are the best cookies I have ever had. Currently my favorite dessert.